Carl Dover, age 92, passed away on September 7, 2018 in Madera, Ca. Carl was born in Tennessee to Edgar and Ila Dover on November 19, 1925. 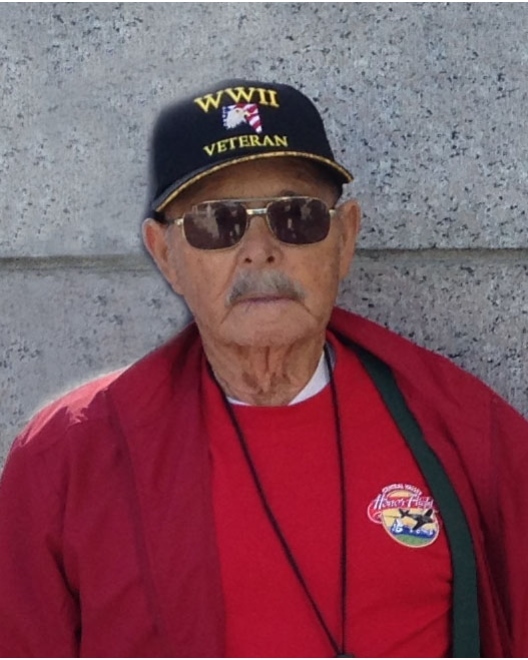 Carl was a WWII Veteran having served in the United States Navy. Carl was very thrilled to be a part of the Honor Flight in October, 2015. He talked about it all the time and tried to get other veterans to apply. Carl was a resident of Madera for over 85 years, where he worked for over 30 years as a butcher at Safeway. Not only was Carl a master carpenter, he was an avid fisherman and hunter as well. Even though his body would not always allow him to be out hunting and fishing, his heart still carried a huge passion and desire for going. Carlwas preceded in death by his parents, Edgar and Ila Dover, and his sister Rosie Ivalene Browning. Carl is survived by his loving wife of over 71 years Betty Dover of Madera, his two sons Gary and his wife Carol Dover of Coarsegold, and Stanley and his wife Jackie Dover of Madera, and his daughter Beverly Tischmacher Dover of Madera. Carl also leaves behind his two grandchildren Colleen Duran and Kayla Collins. A Graveside Service will be held on Thursday, September 13, 2018 at 10:00 AM at Arbor Vitae Cemetery, Madera, CA.